To the City of New Brunswick for the important redevelopment of lower George Street. The City of New Brunswick and its partners have been creative in leveraging available public and private resources in order to spark the revitalization of the lower George Street neighborhood. Like many American cities in the early 1970s, New Brunswick’s economic and residential bases were in decline. Middle-class residents and businesses moved out to new suburban locations leaving the city with deteriorating infrastructure and decreasing property values. The city decided early on that it could not combat these trends alone. In 1976, shortly after Johnson & Johnson announced its intention to build its new world headquarters in downtown New Brunswick, the city’s governmental and corporate leadership banded together to create the New Brunswick Development Corporation (Devco) to serve as a nonprofit urban real estate development company in order to jumpstart the city’s economic resurgence. 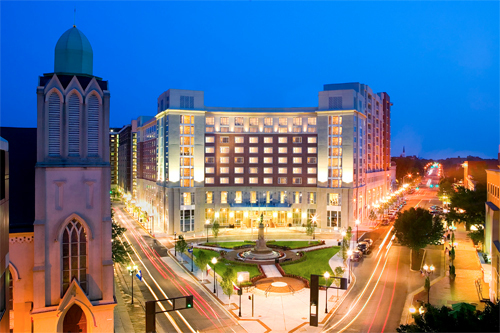 Devco’s first achievements included the development of the new Hyatt Regency hotel and the creation of the New Brunswick Cultural Center. These three major votes of confidence were just the beginning of the positive trend in New Brunswick. Since then, the downtown district has seen significant investment, including new office buildings, new in-town market-rate, affordable, senior, and luxury housing, and new civic buildings. The vitality found in the central business district stood in direct contrast to the conditions in the lower George Street neighborhood, however. Despite only being a few blocks away, the lower George Street corridor between New Street and Commercial Avenue seemed immune to the revitalization efforts in the central downtown core. Businesses in the district reached a vacancy rate of 24 percent; worn façades and other evidence of a lack of private investment characterized the commercial buildings. In addition to these signs of distress, more than 38 percent of area residents had incomes below the poverty level. New Brunswick Homes, a high-rise and high-density public housing apartment complex dominated the northern portion of the neighborhood. Recognizing the need for reinvestment in the corridor, the city saw a huge opportunity in the federal HOPE VI grant program. Run by the US Department of Housing and Urban Development (HUD), the program was designed to transform failing public housing developments, in part through the creation of new mixed-income communities and the integration of public housing in non-poverty neighborhoods. In 1998, the New Brunswick Housing Authority successfully applied for and received $7.5 million toward a four-phase, $43 million revitalization program targeted in the lower George Street neighborhood. The HOPE VI plan’s success depended on the involvement of the major stakeholders, namely the residents group New Brunswick Homes Residents Council, the City of New Brunswick and the developer, The Community Builders. Working together, these groups created a plan for the replacement of 246 units of high-rise housing with 198 mixed-income townhouse and low-rise units. More than $35 million in private and public funds was leveraged to get the job done. Along with the construction of high-quality affordable housing, the HOPE VI revitalization effort was designed to include an extensive resident services and community-building program component geared toward helping families achieve economic self-sufficiency. To date, the four public housing towers have been demolished and Hope Manor, the first construction phase of the work program, is complete. Hope Manor includes 68 homes, 15 of which are rehabilitated existing homes and 53 of which are new construction. Currently under construction is phase two, Riverside, which will consist of 76 homes directly on the site of the New Brunswick Homes towers. As the Housing Authority coordinated the planning for the HOPE VI project, the city and Devco devised a way to provide the neighborhood with a new, much-needed community school. Frustrated with the typical and lengthy school construction cycle, the city and the New Brunswick Board of Education worked with the nonprofit developer to find an efficient means to build the new Lord Stirling School. The partners decided to use the existing Local Redevelopment and Housing Law, the foundation for the redevelopment process in New Jersey, in a new way – to build a public school. To finance the project, Devco established a unique partnership with First Union Bank to obtain a construction loan, utilizing its contract with the Board of Education as security for the loan. The city, Devco and the Board of Education did not plan just any school, however. The new Lord Stirling School was designed to be a focal point in the lower George Street neighborhood, accessible to the community. Rather than relocating the school to a different, more remote part of town, the school was deliberately sited on a highly visible part of George Street. The entrance to the school was placed right off of the sidewalk, not setback behind fences and gates. Today, the street comes to life each school day as students walk to and from school along the busy corridor. The 103,000 square foot facility offers more classrooms as well as a state-of-the-art auditorium, full-service gymnasium, as well as a cafeteria. In addition, the old Lord Stirling School, now vacant, will be re-used as affordable senior housing as part of the HOPE VI project. Down the street from the new school will be Heldrich Plaza, now under construction. 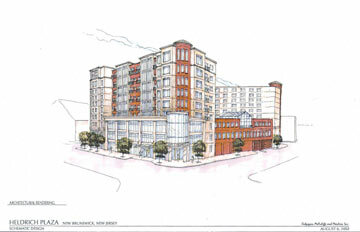 The project, located on 1.8 acres at the intersection of Livingston Avenue, New and George Streets, is a unique partnership between Devco, private developers, Rutgers University, New Jersey Department of Labor, New Jersey Redevelopment Authority, and the City of New Brunswick. The cornerstone of this mixed-use facility will be the John H. Heldrich Center for Workforce Development, the nation’s first university-based research and policy center dedicated to raising the effectiveness of the American workplace by strengthening workforce education, placement and training programs and policies. When complete, the $100 million facility will also include 250 hotel rooms, a conference center and 25 high-end condominiums. The nearly 7,500 square feet of retail space planned for the building’s street front reflects the city’s interest in maintaining urban vitality and pedestrian life on the corridor. Heldrich Plaza is only the start of the University’s presence in the lower George Street neighborhood. Plans are also in the pipeline at the other end of the corridor for a new Rutgers public-safety building near Douglass College. This project will redevelop a dilapidated area across the street from the new Lord Stirling School and will contribute a sense of security in the community. The 24-hour presence of this building and the added security it brings will give more confidence to Rutgers students traveling between downtown New Brunswick and Douglass College as well as to neighborhood residents. Similar to other projects in the area, Devco will serve as the developer for the project, with Rutgers committed to a 30-year lease for its public safety and transportation offices. The project will also include retail development on Commercial Avenue and a parking deck in the rear. On the opposite end of the lower George Street corridor, across from Heldrich Plaza, Devco and the University have announced plans for a new bookstore with more than 200 units of student housing upstairs. This project would add nearly 800 Rutgers students to the local population, creating a market for more retail and local services. In all, there is nearly $300 million in development taking place in the corridor along George Street between Monument Square and Douglass College. The area is within walking distance to many large employers such as J&J, UMDNJ, Robert Wood Johnson University Hospital and Rutgers University. All of these assets combined with the city’s partnerships with Devco and other local stakeholders have made the lower George Street neighborhood attractive for redevelopment in a way that is good for the community as a whole.